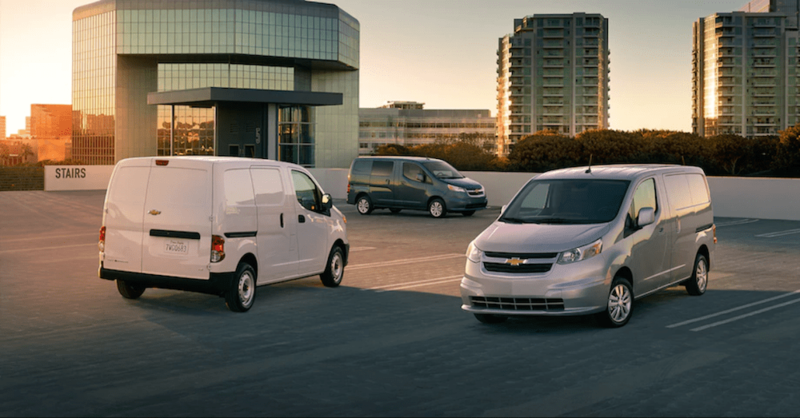 If your business requires you to make deliveries and carry materials around a city location with small alleyways and narrow streets, the Chevrolet City Express can be the right choice for you to have the drive you’re looking for when you get out on the road to get things done. This is the work van that brings you the compact size you want along with the fuel mileage that will make sense for your drive on the roads in your area. You’ll be able to set this little van up the right way for the work you need to get done. Imagine loading up a large amount of cargo in a small van and heading out on the road to get your work done. That’s exactly what you’ll be able to do when you head out and enjoy the ride of the City Express, because the truth is, the coveted Chevrolet Silverado 1500 doesn’t always cut it as the best work vehicle for the job. The enclosed cargo area is perfect for the gear you need to take with you and the low load floor saves your back in the process to make sure you can get the job done without injury or strain that you don’t need to experience during your day. While you might not expect a work van to be upgraded much at all, the Chevrolet City Express is one that has been improved with the benefits you need for the work you want to get done. The inclusion of new standard items of the rearview camera and Bluetooth connectivity will make it easier for you to stay focused on the road you drive and avoid any accidents when you drive. This connectivity allows you to have the GPS navigation system from your phone projected through the audio system to make it easier for you to find where you need to go for each appointment. When you take a look at this Chevrolet City Express work van and want to put it to work, you’ll love the fact that it’s a bare bones model that you can equip the way you need to. This is a work van that shows up with power windows and door locks along with the Bluetooth and a rearview camera to give you the power items you need. The seats and floor liner are made of vinyl to make them easy to clean. You’ll also enjoy the solid rear doors, locking glove box and the range of information offered on the driver information screen in the dashboard. Moving up to the 1LT trim you add cruise control, two 12-volt outlets, rear parking sensors, keyless entry, and heated and power adjustable side mirrors. You’ll have the choice to add glass side panels, a Technology Package that adds a navigation system and a color monitor to this impressive work van. You’ll also be able to choose a rear window defogger, rear parking assists, and cruise control as options for the 1LS model that can be the right choice for you to have the drive you’re looking for during your workday. There is only one powertrain offered for the Chevrolet City Express and it’s a 2.0-liter four-cylinder engine that makes 131 horsepower and 139 lb.-ft. of torque that’s attached to a CVT automatic transmission. This powertrain is good for 24 city/26 hwy mpg for the drive and it allows you to pull as much as 3,200 pounds behind you when you get out on the road to get the job done. This powertrain allows you to save some money when it comes to the gasoline you’ll need for the drive you make on a daily basis. If you’re looking for a work van to help you get the job done and you want to experience the ride that makes sense for you, the 2018 version of the Chevrolet City Express can be the model you’re looking for. This is a small van that can fit in your garage at the end of the day and it can be set up with the items you need for your daily work when you want a van that can fit everywhere you need to go. Come in and see your nearby Chevrolet dealer to take a look at this excellent work van today.